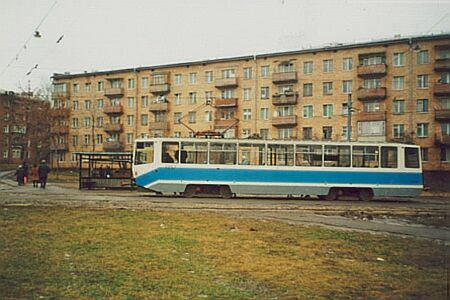 The first regular tram came to Tcheryomushki terminus in the south of Moscow on October 29, 1953, when a new line along Bolshaya Tcheryomushkinskaya Street began a revenue service. 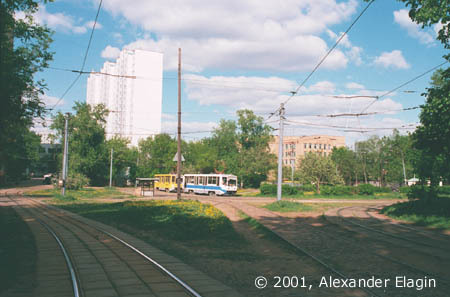 Three years after the line was extended further to the south-west crossing Novie Tcheryomushki district and joined the tramline to the new Moscow University along Vavilov Street. 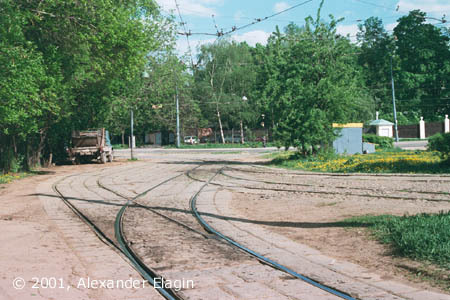 Track layout of this terminus is unique for Moscow, for there are two overlapping reversing loops of opposite directions here. It is rather difficult to describe - better look at the drawing at the bottom of this page. Today only one of this directions is used for reversing trams of route 38, the otherwise loop is used for unregular shortened trips from Universitet to Tcheryomushki. Multiple switches are located in the northmost area of the terminus where the overlapping loops cross each other. 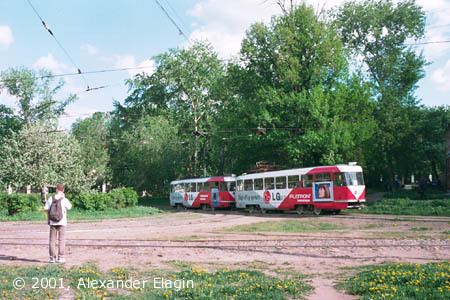 Two tramstops: the left one is for trams of route 26 heading to Universitet (this set of two Tatras is just arriving), and the right one is the final destination for route 38. 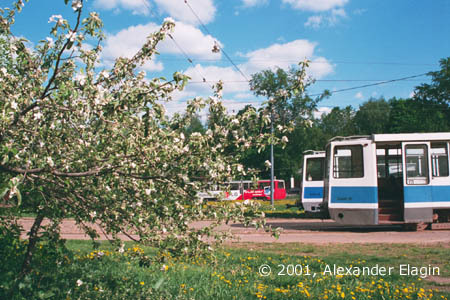 An apple blossom in the terminus. A nice view, isn't it? 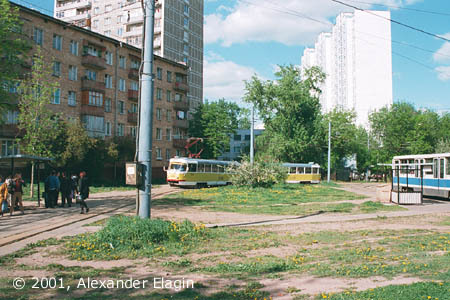 Tcheryomuski district was one of the first districts of Moscow erected in 1950s using a very modern for those times method of industrial construction of typical 5-storey dwelling houses. The control room for route 38 is situated in this building, and a driver of this tram has just returned to his vehicle preparing for departure. Another train of route 26 wearing LG advertising enters the terminus from the south, now en route to the city centre. Note another apple tree in the central area of the loop. The last look at the terminus from the south. The unused track in the middle is still paved with wild stone - this is one of the last places in Moscow still having such a pavement. This schematic drawing will give you some ideas about the track layout of this terminus.